Maryborough, a city, is 220 km north of Brisbane. It is 20 km upstream on the Mary River which enters the strait that runs between the coastline and Fraser (Great Sandy) Island. In the nineteenth century it developed as a hinterland railway town, with major engineering works capable of producing both locomotives and ships. While manufacturing has declined since World War II, Maryborough retains more port and engineering heritage than any other inland port in Queensland. South of Fraser Island is Wide Bay, and when the river was identified by Andrew Petrie in 1842 he named it Wide Bay River. Pastoral settlement in the Wide Bay area led to a wharf being constructed in 1847 on the north side of the river for transporting wool. This area is now Maryborough West or Baddow. A pub or shanty at the wharf soon followed, and in 1848 the river was renamed in honour of Governor FitzRoy's wife, Mary. The Baddow wharf was in shallow water, and a new settlement began on the northern riverbank in the 1850s, at a site then known as Maryborough East. 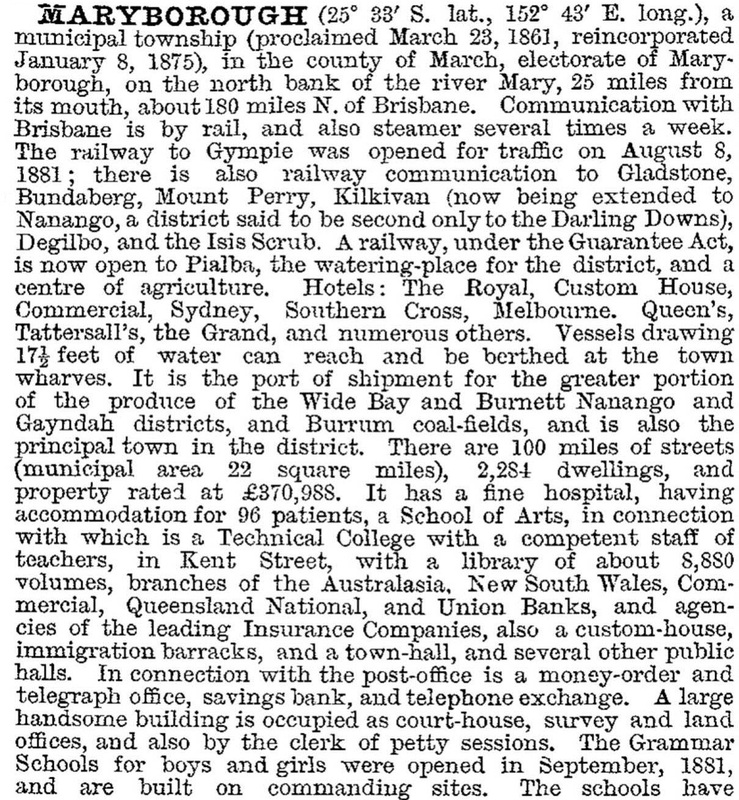 Maryborough was declared a Port of Entry in 1859 and a municipality in 1861. The formation of the municipality coincided with the opening of a customs house, a court house and a school of arts. Maryborough's role as a port quickly grew when a rush to the Gympie gold field began in 1867. Access from Brisbane to Gympie was by an inland route, over wet and hilly terrain. Provisions as well as prospectors came via Maryborough. Trade and commerce required a new post office (1867-69) and travellers required accommodation. The Customs House Hotel opened in 1868, the Engineers Arms Hotel in 1870 and Gataker's wine and spirits store in 1870. About the time of the Gympie gold rush, the sugar industry expanded around Maryborough (a mill was built in 1865), and a large timber mill opened. Sensing an opportunity, John Walker of Ballarat, Victoria, opened a branch engineering works, trusting that his experience with mining machinery would also bring contracts from Gympie. The rapidly developing town outgrew most of the original church and administrative buildings. A new court house and a lands office were built in 1875-77 (both are on the Queensland heritage register), and a new school of arts was opened in 1880. Boys' and girls' grammar schools were built in 1881-83, and Maryborough's role in education was emphasised when they were combined and enlarged as technical and State high schools. The arrival of federation ushered in a new customs house which functioned until 1987. Timber and mining were strong industries, but closer-settlement and improvements in dairy technology led to the formation of the Maryborough Cooperative Dairy Association (1902) which developed a network of butter factories around Wide Bay. The sugar industry around Maryborough lacked a central mill, in contrast to towns such as Mossman, Mulgrave and Nerang. Government assistance required a mortgage over sugar growers' land, but Maryborough growers held back from such a commitment because they could diversify into dairying or other crops. 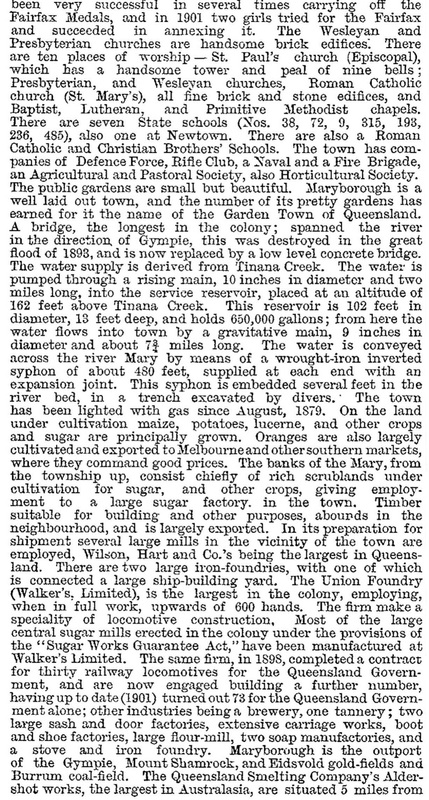 Floods in 1890 and particularly 1893 inundated cane farms and local mills, emphasising the need for a large mill above flood level. A locally-financed Maryborough Sugar Factory was built, and opened in 1895. The factory's success owed much to a partner of John Walker from his Ballarat days, Tom Braddock, who understood mill machinery and chaired the Sugar Factory company. (His grandson, also Tom Braddock, was chair of the company until his death in 1983. He had also been chair of Walker's Ltd until its takeover by Evans Deakins Industries.) The opening of the factory coincided with a branch railway line north-east to Pialba, allowing growers to send their cane straight to the Maryborough mill. It also gave the inhabitants ready access to a coastal watering spot. In the early 1900s Maryborough was the shipping port for the Gayndah, Gympie and Eidsvold districts, the Burrum coal field and Wide Bay-Burnett in general. It had ten churches, including several fine brick edifices, seven State schools and two Catholic schools. The Lamington bridge, joining the town centre to Tinana, was built in 1896. The public gardens were impressive, earning Maryborough the title of Garden Town of Queensland. Walkers Ltd manufactured most of the machinery for sugar mills, along with locomotives (73 by 1901) and ships, employing 600 people when in full production. Maryborough suffered from the postwar decline of manufacturing and dairying. In the 1930s its cooperative dairy association had branch factories at Kingaroy, Biggenden, Mundubbera and Wondai, but after the war prospects for dairying in the Wide Bay region were problematical. Walkers, the Scotia Foundry and Dominion Milling all faced long term declining markets. Between 1971 and 1981 manufacturing employment in the Maryborough district fell from 28% to 22% of total employment. The figures in food processing (a manufacturing sector) were little better: from 30% to 26% (1971-81), and the meatworks ceased operations in 1983. In 2001 manufacturing employment amounted to 14.5% of the total. It was exceeded by wholesale and retail trade employment (22%). Health and community services accounted for 12.8%, education employment 8.3%, and accommodation and hospitality just 5.1%. The Walkers shipbuilding facility closed in the 1970s, but the company's railways work continued after takeover by Evans Deakins Industries in 1970. It has built the high speed tilt trains for country rail services. Despite the historically and culturally interesting built landscape of Maryborough, tourism-related employment did much better around Hervey Bay. In 1981 the Australian Heritage Commission registered five buildings in Maryborough, and in the late 1980s an archaeological survey was made of the first European settlement site at west Maryborough (near the Bruce Highway bridge over the river). The site was an example of a pre-survey Queensland town. Since then there has been a growing appreciation of Maryborough's historic buildings, civic, commercial, religious and domestic. Many are of sandstone; most of the residences are timber, ranging from humble cottages to expansive 'Queenslanders' overlooking the river on the broad main streets. The heart of Maryborough's heritage area is bounded by Lennox, Kent, Wharf and Sussex Streets, together with Queens Park which adjoins Sussex Street. The park (1873) is a botanic garden, with an ornate bandstand (1890), lily pond and war memorial (1921). In Wharf Street there are a very early shop (c1860) at No 134, the former Government bond store (1863), the vernacular tin and timber Waterside Workers hall (c1918), the Criterion Hotel (1878), Gatakers warehouse (c1873), the customs house (1868) and government offices (1940). Kent Street has nearly as many heritage sites, including the Australian Joint Stock Bank (1882), where P.L. Travers, author of Mary Poppins was born, the Central State School (1876), the former Boys' Grammar School (1881), the School of Arts (1888) and the city hall (1908) designed by Hall and Dods. The impressive St Mary's Catholic church (1872) and St Paul's Anglican church and hall (1871, 1929) are in Adelaide Street. Lennox Street is the address of the railway station complex (1864) and the Brennan and Geraghty store (1864). All the foregoing sites are listed on the Queensland heritage register. Maryborough has several suburbs which are described in separate entries. Until 1976 Maryborough's local government area was never more than 24 sq km. In that year Burrum Shire was changed to Hervey Bay Shire, but with the transfer to Maryborough of part of Tinana, south to Poona Point, and the southern half of Fraser Island. Maryborough City's area then exceeded 1200 sq km. Most suburbs have primary schools. There are State high schools in the city centre and at Fairfield (Aldridge High, 1973), and Catholic primary and secondary schools. Retailing is focused on the city centre and on drive-in centres along Alice Street: Station Square (supermarket, three discount department stores, 42 other outlets opened in 2000), and Maryborough Plaza, built on the site of Fairlie's joinery works, in 1991. Until the 1920s crossing the Mary River depended on ferries and the Lamington Bridge. In 1926 the Granville Bridge was opened, and in 1988 the Henry Palmer Bridge joined Baddow to Tinana. The Council built a swimming pool in the river in 1906. An aquatic centre at the corner of Kent and John Streets opened in 1961. Each year Maryborough hosts the Fraser Coast Show, descended from the Wide Bay and Burnett Pastoral and Agricultural Society's first show in 1876. A pavilion and exhibition hall were added in 1887, and a new complex was built in 1979. The winding back of some of the riverside industries has released land for recreation and tourism. Wilson and Hart's sawmill at the end of Walker Street, just north of the Wharf Street precinct, was closed in the late 1980s, and was replaced by the Brolga Theatre in 2000. During the 1980s Maryborough City entered into several facility-sharing arrangements with adjoining shires. In 2008 Maryborough City, Hervey Bay City, Woocoo Shire and part of Tiaro Shire were amalgamated to form Fraser Coast Regional Council.